Northway Motorsports, a Victory motorcycle dealer, has agreed to sell Ride Minnesota! The dealership is “way the heck out there” on Hwy. 65 in East Bethel. It’s next to Fat Boys Bar & Grill, a family-friendly biker hangout. I’m acting as the wholesaler to the final seller in this deal, a new role for me. Faith, the lady from Northway who called to order the book, said she thought it would “really move fast.” She also said I’d done a good job on the book–she wanted to get out and try some of the rides. Sweet music to my ears! 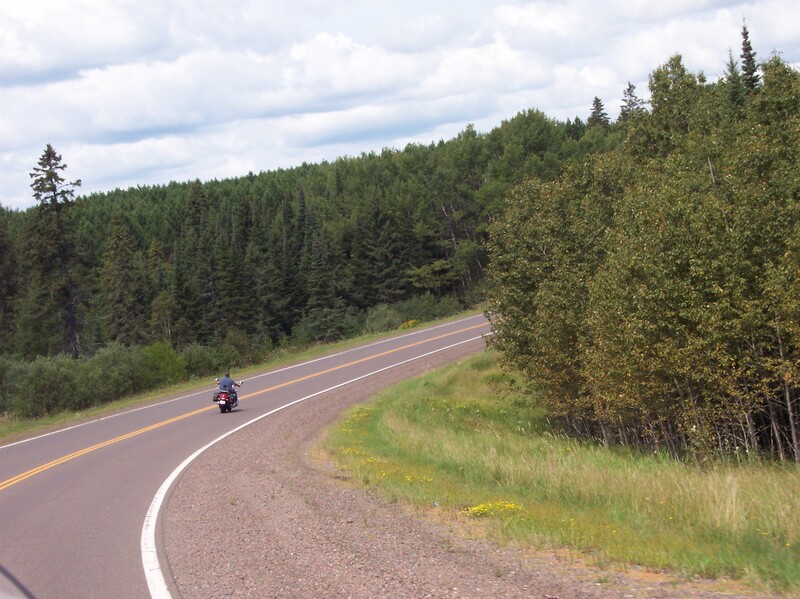 One of my favorite rides in Ride Minnesota is also “way the heck out there”–the Gunflint Trail in northeastern Minnesota. It twists and turns out of Grand Marais as it leads you to the Boundary Waters Canoe Area Wilderness. There’s only one way in and one way out. But you’ll have to read the book to learn more about it. Here’s what the Gunflint looked like last August.